Disposable app? How does that make sense? As business technologies and opportunities continue to race by at a head-spinning pace, the traditional models of software development and usage are often no longer appropriate. That’s where the disposable app comes in. Disposable app? How does that make sense? It takes a lot of effort and time to create an app, doesn’t it? Why would someone go through all that trouble to create something temporary? Well, as organisations become more agile and as they grow and embrace digital transformation, the rules of business apps are changing. Read on to learn more about this versatile option and whether it could be a good fit for your organisation. Information technology expenditures have traditionally been made with the long term in mind. When IT is building custom software for an organisation, they are typically making a significant financial investment, and they want to get the value back over a long period of time. This is especially true of expensive applications that are necessary for running the enterprise at scale. They are likely to have a long lifecycle. However, not all business apps are created equal; they do not all serve the same purpose or the same user base. There’s a difference between an app that represents a strategic investment and one that has a tactical operational-type approach. In today’s quickly changing technology and business environments, the need in the organisation, or in the team that introduced the app, might change rapidly. For instance, in less than two years, that need might not exist, or it might be completely different. That means the solution itself would be temporary and subject to change. The organisation or team may want to stop using it or change it so dramatically that they would essentially have to start all over. So then, a disposable app will have a very short lifecycle. Many companies start on the path toward mobile apps, for instance, as a way to replace paper processes. They take their existing workflow, their paper form, and replace it with something that mimics in the digital world what they had in physical format. But as they start using this app and transforming their business, they’ll realise that their paper form doesn’t translate well to the digital world. They find new ways of doing business, and the company starts changing. So then, the app that originally existed just to replace paper no longer works with the new goals they want to accomplish. The original app usually gets disposed of or gets modified heavily and transforms into something completely new. Consider this scenario: you see that the business you are running has problems that are, in and of themselves, subject to change over time. You know that between five and 20 people will be using these apps and that most of your apps will not persist beyond a short window – be it months or years. Consequently, you want a low-investment option. It doesn’t make sense to spend a six-figure sum for projects that are going to be used by a small audience, will be delivered quickly and will live only a short time. Flexibility is key. This situation is ripe for a disposable app. 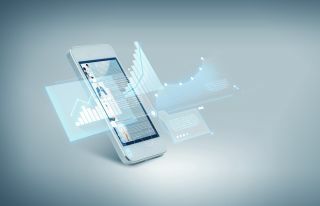 The notion of a disposable app lines up well with a philosophy for IT management and app delivery that has been fostered by the industry analysts at Gartner. It’s the notion of what the firm calls bimodal IT. Gartner defines the classic mode, or Mode One, as a situation where the IT team is dealing with the large-scale apps that matter for the enterprise. They absolutely require certainty and predictability in those apps. The IT team does not make radical changes, because the company cannot absorb that risk. So, Mode One is about certainty, predictability and evolution. Mode Two, though, has software demands that are more dynamic. Gartner’s Mode Two is where the IT team explores changes to the app in an innovative fashion. In this mode, organisations can absorb more risk and attack problems a bit more creatively. This is the mode of the disposable app. Let’s suppose that you have discovered a business challenge that might be solved by a disposable app via small-scale, rapid, responsive delivery; a short development cycle; and lower investment, then the first thing to do is to pick a toolset that will enable you to deliver it. Low-code and no-code development platforms – which don’t require extensive coding experience to use - have become increasingly popular for just this reason. These types of platforms enable a pro developer to deliver something very quickly and inexpensively to their end users. These tools also can be used by non-developers in the organisation. The line of business, for example, is one of the classic use cases for a disposable app. No one knows a person’s job as well as the person doing it. When you’re determining requirements for delivering an app, one of the great challenges is that the farther you get away from where the rubber meets the road, the more difficult it can be to deliver a useful app in a timely fashion. With low-code/no-code platforms, IT can get much closer to the person actually doing the work – the one who knows the problem and knows the specs intimately. Then IT can understand the requirements with much more clarity and more speed than most traditional development platforms would allow. It’s entirely possible that, after considering the problem you’re trying to solve, a disposable app is the solution. Review this possibility with your line-of-business professionals and decide whether the issue is a short-term one that could be solved by a disposable app. If so, choose a development platform to create your own custom app, saving money and arriving at exactly the solution you need.